We've decided to hit a couple of Los Angeles haunts for our Halloween adventures. In addition to our annual trek to Mr. Bones Pumpkin Patch in West Hollywood, we'll also make our first appearance at Boo at the Zoo at the L.A. Zoo. CC picked out an Ariel princess costume, so after we grab some face paint, we'll be good to go. Keep in mind that Mr. Bones is open through today only, whereas Boo at the Zoo is open tomorrow as well. In addition to its pumpkin patch, Mr. Bones has activities such as the bouncy Jumpin' Pumpkin, face painting, a super slide and a straw maze. Boo at the Zoo offers its own pumpkin patch, a Creepy Creature Encounter with spiders and snakes at the Winnick Family Children's Zoo and an Animal Stomp 'n Chomp pumpkin-style. 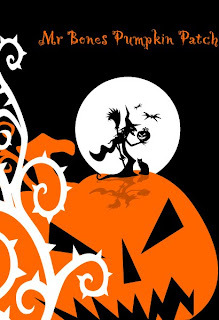 Whatever you decide to do today and tonight, have a safe and Happy Halloween! "Ice Age" made quite the impression in Santa Monica yesterday, as a four-story ice sculpture of our prehistoric squirrel friend Scrat stood a towering 48 feet, 8 inches tall to claim the Guinness Book of World Records title of world's tallest ice sculpture. 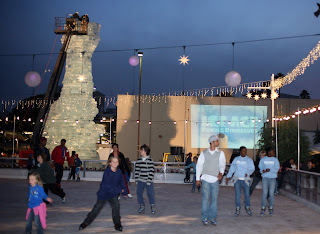 Ice skaters and fans of the "Ice Age" franchise came out in full force to ICE at Santa Monica to see the official unveiling, along with performances by local ice skaters, world figure skating champion Randy Gardner and Scrat himself. Dusty, blustery winds made for an especially winter-like outing, but there were plenty of refreshments on hand, including mini cheeseburgers, wraps and shrimp cocktail -- all billed as healthy -- from California Fresh & Fit. While I was taking in the bustling atmosphere, I noticed there was also a small Tot Spot area at the ice rink, which caters only to skaters 48 inches and under. Guess where we'll be taking CC soon! When CC and I drove to Santa Monica last week to see our first Cirque du Soleil performance, “Kooza,” the air was misty and cold, and the company’s signature blue-and-yellow big top seemed to appear out of nowhere, a moonlit mirage at the Santa Monica Pier. 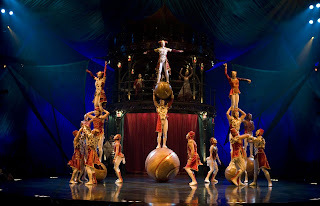 That mysterious setting, and so close to Halloween, only made for the start of an intriguing evening, a dreamlike experience so well conjured by the multicultural Cirque cast. When I was invited to attend a performance of “Kooza,” which is in Santa Monica through Nov. 29, I wondered if I could even bring CC. After all, Cirque shows aren’t necessarily known for catering to the sippy-cup set. But CC was more than welcome, and she even charmed the row in front of us with her spontaneous laughter and shout-outs to the stage. “Kooza” is the story of The Innocent, who is searching for his place in the world and gets swept up into a mysterious (there’s that word again) place filled with a colorful and irreverent cast of characters, all presented to him by an agile guide, aka The Trickster, who sometimes likes to cause lightning storms and laugh menacingly. Some of the highlights included a trio of raucous clowns who played with a dog that actually urinated on the audience. On purpose! Perhaps not surprisingly, CC got the biggest kick out of him and kept shouting for “Puppy! Puppy!” whenever the costumed actor wasn’t onstage. 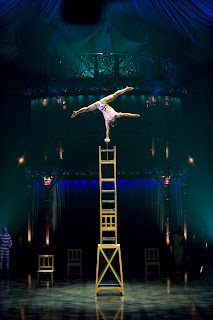 There were also acrobats and tight-rope walkers, a man who seemed to defy gravity with a stack of chairs, a clever pickpocket and my personal favorite – a frighteningly talented juggler who looked like Kevin Dillon wearing a disco ball. It was a late evening, complete with a 30-minute intermission, but CC was a trooper, as usual. She stayed up till the end, until the puppy made his curtain call and waved goodbye, till the last clown left the stage. “Bye-bye, Circus,” she said as we left the tent. And we re-boarded the Big Blue Bus back into the misty Santa Monica night. 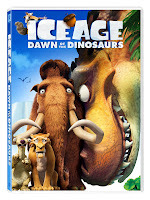 Giveaway: "Ice Age: Dawn of the Dinosaurs" DVD combo packs! The Scrat pack is back! Last week, CC watched “Ice Age: Dawn of the Dinosaurs” -- the third film in the animated franchise about Manny the woolly mammoth, Diego the saber-toothed tiger and Sid the sloth -- and she was completely intrigued by a prehistoric squirrel named Scrat and his quest for a single acorn. That seemingly mundane task, at least for an animal known for acorn stalking, took on dire consequences when he became entranced by a female squirrel who wanted that same acorn. 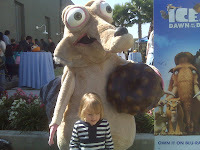 We also were able to meet Scrat in person (er, in squirrel?) on the Fox Studios lot, as director Carlos Saldanha, Blue Sky Studios animator Eric Favela and executives from Twentieth Century Fox Home Entertainment gathered to chat about the DVD, which hits stores today. 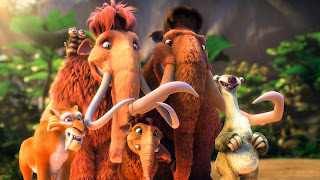 The “Ice Age: Dawn of the Dinosaurs” DVD combo pack – which includes the movie on Blu-ray, DVD and a digital copy – also has cool extras such as a storyboard maker, a tutorial on how to draw Scrat and an interactive cast directory that lets you look up the resumes of voice actors including Ray Romano, Denis Leary, Queen Latifah, John Leguizamo and Simon Pegg. I'll announce the winner Monday, Nov. 2. And, if you happen to be in Santa Monica today, ice sculptors are building the world’s tallest ice sculpture of, you guessed it, Scrat, in an attempt to break the Guinness World Record. The chilly (and free) unveiling will be at the ice-skating rink ICE at Santa Monica -- a wintry oasis amid 80-degree temps -- at 4 p.m. He is expected to stand 45 feet tall, all from 133,000 pounds of ice gathered across four states. Mickey Mouse was the most awaited passenger at Travel Town Museum yesterday, as CC and a host of other kiddies danced, played and boarded the mini choo choo that circled the train-friendly grounds. The event, which featured play stations around the museum where kids could color and test out new toy Mickey's Magic Choo Choo, also hosted a viewing party for the primetime special "Mickey Mouse Clubhouse: Choo Choo Express," airing Sunday, Oct. 25, on the Disney Channel. What's also available for Travel Town visitors is the art exhibit "Walt Disney Express," which will be on display at the museum through Oct. 27. The exhibit includes photography, animation sketches, cells and some of Walt Disney's personal train-related artifacts. Also great was seeing a group of Marines on hand to showcase their Toys for Tots program. Each child, including a reluctant CC, took a Disney toy that had been on display and placed it in a huge box for kids who might not get the latest toys under their Christmas trees. It's a worthy foundation, and I was happy to see CC taking part in something that involved giving away something she clearly wanted for herself. I also got to meet up with fellow LA Mom bloggers Yvonne in LA and Traded My BMW for a Minivan, who also brought their kiddos along for the train ride. When I was on a conference call with Maria Shriver on Monday (and yes, I've been dying to lead with that since the phone call), I was struck not only by her determination and ambitious scope but also by her absolute dedication to the idea that if you have a voice, you should use it. Which is exactly what she's doing with her project "The Shriver Report: A Woman's Nation Changes Everything." Maria has teamed with the Center for American Progress to deliver a report that evaluates the modern role of women in the workforce and how it's changed our reality as a nation. Women make up half of the American workforce. Mothers are the breadwinners or co-breadwinners in 2/3 of U.S. families. And women make 80% of the big-ticket financial decisions in the home. As women also provide a heavy amount of child care and elder care in addition to holding down jobs, it's time, she said, that employers took that into consideration with alternatives such as flex time and offering opportunities to work from home. "We are sometimes brought up to just go along," she said. "But we have to use our voices to ask for flex time and to be a virtual employee." It's the flexibility issue that stands out. "How can we adjust to bring in income but also care for our children?" Maria asked. Not only that, but as John said, "The battle of the sexes is over." "This has been a trend that's been coming for 30 years, and the recession was the tipping point for women to dominate the workforce," John said. "Both men and women see this as a positive development." And, according to Maria, businesses are open to being smarter. "So many families need two incomes in order to survive," she said. "Women I've talked to define their success and power in a different way. Having control over their schedule, to be a mother when they get home, that's how they define power." But when both parents work and are expected to give more and more at the office, it's their kids who see the effects of that. "Men and women are concerned about the ramifications on children," Maria said. "That's why flex hours are so important." In "The Shriver Report," she has included many other voices to illustrate various points of view. Hilda Solis, Secretary of the U.S. Dept. of Labor, writes about her parents' hard work. Another woman writes about her life as a military spouse. MomsRising.org co-founder Kristin Rowe-Finkbeinder talks motherhood and money. It also comes back to our voices and how we can be better heard to make sure businesses, employers, are more family-friendly. And, as Maria said, "If women come to the table with the right information, we can make incredible change." 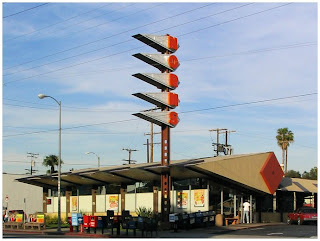 Giveaway: Norms Restaurant celebrates 60 years in SoCal! Ian, CC and I have driven by Norms Restaurant plenty of times, and I've always thought it looked like somewhere Starsky and Hutch would go if they got hungry while chasing bad guys in the '70s. 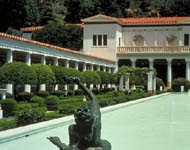 It typifies that mysterious part of Los Angeles that seems to exist in another era -- and in this era at the same time. Perhaps its the retro architecture, or perhaps it's their comfort-food menu that's always in style no matter what people are wearing, be it poodle skirts or faux-hawks. In any case, I was down for a cheeseburger, and this 24/7 eatery in West Hollywood (among other SoCal locations) was ready to provide a 1/2 pound of cheesy goodness. (Ian decided on the healthier soup and salad.) We also went on a Tuesday, when kids eat free. So CC swung for Hey, Batter Batter (aka fried fish fillets). Norms: 3. Hunger: 0. Wallet angst: Less than 0. We had a great time at the place referenced in Tom Waits' song "Eggs and Sausage." The place, on a rainy(!) 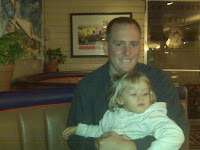 and cold L.A. night, was not very crowded, which helped with some nighttime grumps from the *cough* toddler *cough*. The staff was friendly and smiled through our Terrible Twos pain. It was also fun eyeing the menu, which noted the 60th anniversary of Norms. Apparently, Meryl Streep was also born the same year as Norms, in 1949, when the average yearly income was less than $3,000 and housing prices were a mere $7,500. That last fact almost made me choke on my sesame-seed bun. Good luck, and I'll announce the winner Monday, Nov. 9! 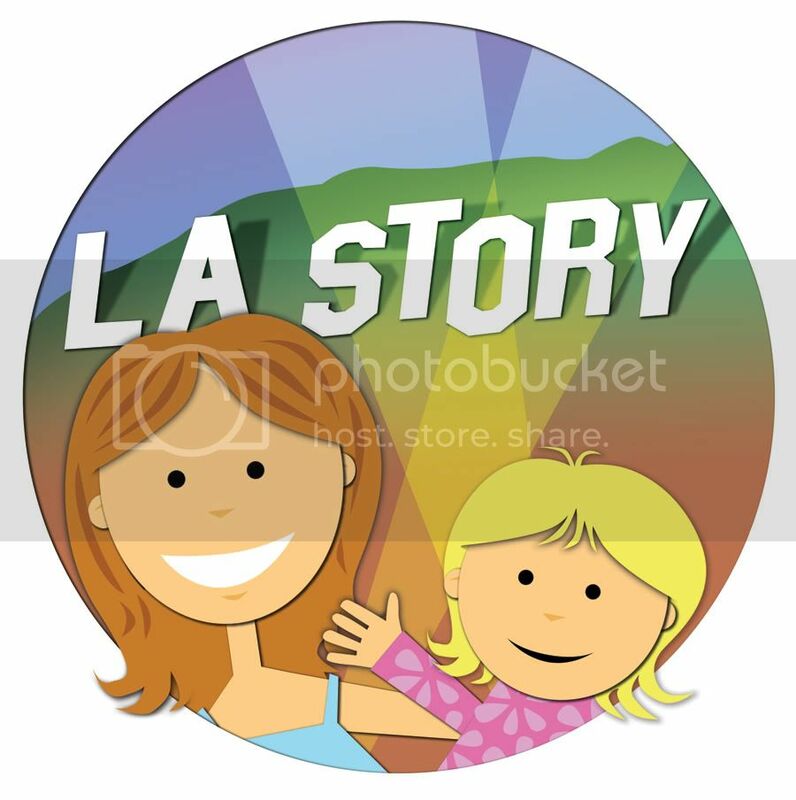 Parenting water-cooler site MomsLikeMe.com has asked me to be a discussion leader for its Los Angeles outlet, and of course I'm happy to add my two cents when it comes to kiddos. Besides, I could use the mom-friendly help and advice myself. Take a look when you get a chance. There are so many great topics that moms around town are buzzing about. For example: "Fess Up! How gross is your mom-mobile? "; "Should your child's teacher tweet? "; and "Toddlers and pets? Frenemies?" In any case, feel free to weigh in. Let's hear what's on your mind. Besides, I'm dying to know how many Cheerios are lining the floor mats of your mom-mobile! Lately, CC's been having trouble sleeping. Actually, she just avoids it as much as possible. So I wasn't surprised when she came into the living room last night, when I was typing away on the computer, and asked if she could sleep on the couch. She had been sick this weekend, and Ian had been working a lot, so I thought I would indulge her a little even though it was late. "OK, Sweetheart," I said, "but Mommy's working. You need to get some rest." "Yes, now go to sleep. I'm right here." And that lasted only a few minutes. Pretty soon, I heard her padding around, pulling out tissues and putting them on the cat. I turned around, exasperated, and said, "This isn't play time. It's time to go to sleep." She looked up at me, in her footed pajamas, tissue in hand and grabbed one of the blinds on the window. After rubbing a spot where she had smeared green crayon marks a few weeks ago, she said, "I working, too. I clean the windows." And all of the exasperation left me, like air from a deflating balloon. I sat down, hugged her and kissed her cheek. Then she took the tissue and starting rubbing it on my face and in my hair. 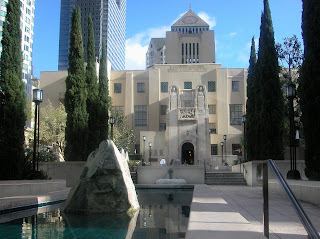 On Saturday, Oct. 17, the Los Angeles Central Library downtown will kick off its free Performing Books program in the Mark Taper Auditorium. The program, which spotlights one book each month, accompanies storytelling with music. This weekend's selection is "Tubby the Tuba," by Paul Tripp, about a tuba that's tired of just playing "oompah, oompah." Besides the storyteller, there will also be tuba and synthesizer players on hand. Upcoming books are: "Piano Starts Here: The Young Art Tatum," by Robert Andre Parker (Nov. 7); "The Composer is Dead," by Lemony Snicket (Dec. 5); and "Opera Cat," by Tess Weaver (Jan. 23, 2010). The recommended ages are children 4-10, and all families are welcome. Performances are at 2 p.m. and 3 p.m. Yes, it's been a literary few days here at L.A. Story, but who's complaining? 2 p.m. and 3 p.m. 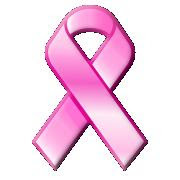 Please check out my latest LA Moms Blog post, "Some family ties are wrapped in pink ribbons." After much procrastination, I finally scheduled my first mammogram -- recommended by my ob/gyn because of my family history. I am only 34 years old, six years younger than the recommended age of 40, but my mother is a breast cancer survivor and she went through that while she was still in her 30s. It also happens to be National Breast Cancer Awareness Month, which is an interesting coincidence. The last two Mondays, CC and I have popped in at the Fairfax Branch Library over by The Grove and Pan Pacific Park to take in a little storytime and some tyke interaction. We got to hear, among others, "I Love You Just the Way You Are," by Virginia Miller, and "I Went Walking," by Sue Williams. There was also crazy felt-board action and lots of singing, which CC loved. Anytime your child can "moo" in public without heckling or stares is quality time in my book. 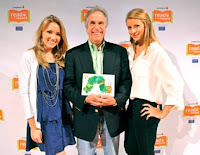 Lo Bosworth, Henry Winkler, Emily Osment and Bill Nye the Science Guy showed off their reading chops yesterday at downtown's Los Angeles Public Library, as they engaged local preschoolers with Eric Carle's "The Very Hungry Caterpillar." I was lucky enough to watch as kids from Trinity Unlimited and West Side Children's Centers listened (and made shout-outs!) as "Mr. Henry" and the gang read that favorite snack-filled story. Overcoming dyslexia to learn how to read, Henry Winkler has written 17 children's novels (for ages 7 1/2 - 12) with Lin Oliver -- all centered on dyslexic main character Hank Zipzer. The best-selling novels are the story of Henry's life as a dyslexic, and Hank, Henry said, is "a funny guy." "Reading was so difficult for me that I did not really read a novel until I was 40 for pleasure," he said. "I always thought that I couldn't do it, that it was too overwhelming," he added. "Now, of course, I have a great time reading." He's also a fan of "The Very Hungry Caterpillar": "I read that to my own children. Remember, it's been around for quite a while. So, it was part of our library, and I'm having my first grandchild --my wife and I, my oldest son -- at the end of October, and it's now part of their child's library." We chatted more about our kids, CC included of course. "There are no words," he said, referring to the miracle of life. And I have to agree. There really are no words to describe the wonder of it all. Henry also gave me some insight into his writing process with Lin: "Wherever my dyslexia bumps up against the world, we put it into Hank. And he's very resourceful, and he's very funny. "He believes that his imagination has great personality, so on Halloween, most kids, when I ask children, 'What did you go as for Halloween?' they all say, 'The Grim Reaper. A nurse. An astronaut.' He goes as a table in an Italian restaurant. And it doesn't work out very well. He can't get through the door." Before she had to go on stage, Emily Osment ("Hannah Montana") talked to me about her favorite children's books. "I always liked 'The Bearenstain Bears.' I used to read those all the time. Of course 'The Very Hungry Caterpillar,' 'Goodnight Moon,' the 'Frances' books." She said her English teacher mom had a lot to do with her reading. "She just always, from a very young age, gave me a lot of books." "I'd read all the books she told me not to read," Emily added. "She was like, 'You can't read this book until ... like wait a year until you can read this book. And, of course, that would always intrigue me, and I'd read the books I was too young to read." So was that a savvy parenting technique on her mom's part to encourage reading? "I think I was just sneaky," she said. "We always did this thing when I was little, when 'Harry Potter' first came out. We'd read one chapter a night, which can be like an hour, and I'd always sneak and read a couple more pages. So she'd be like, 'Emily, what do you think is going to happen?' and I'd totally know because I'd read it." It also helped to have an older brother who liked reading. "My brother (actor Haley Joel Osment) was always reading a really interesting book when I was little. He's four years older than me, so I was always interested in what he was reading because it always seemed better than what I was reading." Emily's also happy to be reading to kids through Jumpstart's program. "They put books in the hands of kids from such a very young age, especially the kids that don't have the opportunity to have books or have books available." My last chat of the day was with Bill Nye the Science Guy. And what a fun speaker. He looked like he was having the greatest time up there. Bill was eager to tell me about the novel that really solidified his life as a science guy -- "Carry On, Mr. Bowditch," by Jean Lee Latham -- and which he just adapted into a screenplay. It's the story of seafarer Nathaniel Bowditch, who lived in 1700s Salem, Mass., and found a new way to compute longitude. "The thing is the guy was poor, and he pulled himself up by his bootstraps. And he did this with science and math. And it changed my life. This book absolutely, completely changed my life." But the most important thing to teach kids about education, according to Bill: "If you can read, you can change the world." And, yes, the first book CC and I read together before she fell asleep last night involved a certain caterpillar and how it changed into a ... well, I don't want to give it away. The above photo is living proof that you can take your child to a renowned museum, give her a paintbrush and not wind up with a "priceless" bill at the end of your visit. Thank you, Los Angeles County Museum of Art, for providing the Boone Children's Gallery -- albeit a smaller version while renovations of the larger incarnation are still under way -- where kids can paint, read and express themselves through art without fear of making a mess. Currently located inside the Korean art galleries in the Hammer Building, the gallery boasts its own enclosed area, complete with tables, shelves, books and an open mind. When CC and I arrived around lunchtime on a weekday, we were the only visitors, so we had the space, the paint and the two attendants all to ourselves. They were so patient and welcoming. CC must have gone through 10 sheets of paper -- at one point painting with the water you use to clean the brushes -- and they didn't mind at all. In fact, one of the attendants even taught us a special technique for painting bamboo. Visitors are still just finding out that the mini gallery is open as of last month. And although some other kids and parents did filter in while we were there, I hope more families go. Not only is it an inviting artistic space for even the youngest museum-goers, it's also free -- the version of "priceless" I like most of all. Just in time for Thanksgiving, when we all have to unbuckle the belt a few notches, PBSKIDSGO.org is launching a Web-only series "Fizzy's Lunch Lab." The series, which debuts Nov. 16 at PBSKIDSGO.org/lunchlab, stars Professor Fizzy and his friends as they prepare healthy snacks, investigate the difference between good and bad food and learn what happens once the food you eat goes into your body. “Childhood obesity is a growing problem and we realized that in order to start reversing the effects of our fast-food culture, we’d have to employ some of the same tactics that fast-food giants have historically used to attract children,” said "Fizzy's Lunch Lab" co-creator Evan Sussman in a statement. Enter animation and the Web. 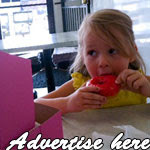 "Fizzy's" will feature video segments, interactive games as well as printable recipes for kids and parents. The program will air a new episode every week for 10 months, with monthly food and nutrition themes. Sounds like a nice -- and healthy -- treat. When I was going through the list of museums on the Museum Free-for-All this weekend, I never thought I'd pick one that was already free. Yep, that was me. Trying to get in for free at the California Science Center, which is a museum that only takes donations. Good thing CC is too young to be embarrassed by me. Nevertheless, we had a great time at the hands-on and super kid-friendly museum in Exposition Park. Once we walked past the donation box -- which seemed to openly mock me -- and up the stairs, CC was immediately taken by the over-sized aluminum tube that served as a twisty example of how sound travels. And never underestimate how much fun a 2-year-old can have from hearing a disembodied voice coming out of a tube. With three wide-open levels, the museum itself is huge and offers plenty of attractions -- including a fog simulator, right -- to stimulate young minds. She also enjoyed spending time in the Discovery Room, using binoculars to go on an animal safari, playing with puzzles that showed the growth of a sunflower and exploring computer games that helped her categorize animals. After a healthy dose of brain stimulation, we made our way outside to stop and smell the roses. If you've never been to the Exposition Rose Garden, it's quite wondrous. I had to hold CC back from leaping into the enormous fountain. And you could get lost in the rows of roses but also take a break in one of several gazebos. It was gorgeous and a beautiful day to match. And, just in case you're wondering, the rose garden is gratis as well. Museums across Los Angeles and Orange County this weekend -- Oct. 3 and 4 -- are taking part in the fifth annual Museum Free-for-All. Twenty-four museums will open their doors gratis, courtesy of the Museum Marketing Roundtable, inviting weekend warriors to experience one or more of the city's (or county's, for those O.C. folks) cultural centers for free. My only question: Should CC and I make it a Museum-apalooza, fitting in as many as we can? Imagined to be a "railroad petting zoo" in the late 1940s by Recreation and Parks employee Charley Atkins, the Travel Town Museum in Griffith Park lives up to those original expectations and more. After one thwarted attempt to see the "choo-choos," CC and I boarded the mommy train (OK, my car) to see what this place had to offer. It was like stepping back in time. There were cabooses, dining cars, steam engines and even an incredibly vintage fire wagon, most looking as if they would tell you a million and one stories -- if only they could. The place was magical for CC. She walked along tracks, brushed her fingers over railroad ties and tried to board the engines themselves. For safety's sake -- and similar to an aging relative -- visitors aren't allowed to climb on most of the trains. After taking a stroll around the area, we boarded what for CC was the piece de resistance -- the miniature train! The museum itself is free, but for $2.50 per person, visitors can ride a small train that twice circles the entire Travel Town grounds. A grizzled-looking but friendly engineer takes the tickets, tells passengers we're headed to San Diego and toots the whistle as we chug around the little track. CC couldn't get enough. We waved to families who were picnicking at little tables in the grassy park area. She peeked her head left and right to see more of the engines on display. There was even a wood-carving artist on site, creating a statue with a chainsaw. The museum was dedicated on Dec. 14, 1952, according to the Travel Town Web site, as the steam locomotive era was coming to a close and major California railroads were more willing to part with their iron horses. So, thanks to Charley Atkins, the Recreation & Parks Dept. and the state's railroad facilities. Without them, we'd be standing on the tracks with nowhere to go and not a locomotive in sight.